It looks like the Joker film has been hit with its first casting shake-up. After it was announced Alec Baldwin was joining the film earlier yesterday, the star has come in to say he will not be in the project after all. According to USA Today, Baldwin says he is “no longer doing that movie” due to various “scheduling” issues. "I'm sure there are 25 guys who can play that part," the actor said. This update is a total turnaround from the report that broke yesterday about the gig. According to Deadline, Baldwin was slated to join Joaquin Phoenix for the solo Joker movie, the first film in a new cinematic franchise at Warner Bros. Pictures. The film, which is being directed by Todd Phillips, will also star Robert De Niro, Marc Maron, and Zazie Beetz. Baldwin was set to join the crew, but it seems the actor has had a change of heart. So far, Warner Bros. has not commented on Balwin’s exit. This update comes shortly after details about Baldwin’s Joker role went public. The film intended the actor to play Thomas Wayne, but the character would be far less stout than expected. Instead, the script reportedly paints the businessman as a tanned, cheesy schmuck molded from a 1980s version of Donald Trump. This note stirred up controversy amongst fans as Baldwin is known for his SNL performance of the President. Now, it seems Baldwin will dodge the controversy entirely by dropping the film from his schedule. Still, the actor did take time earlier today to combat rumors about his Joker-Trump connection. 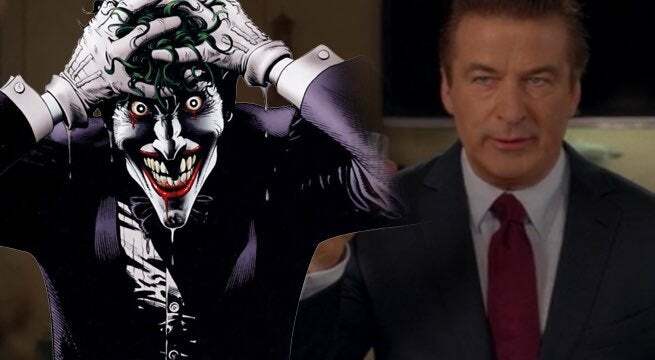 Baldwin used Twitter to say he would not be playing the reported role, writing, "Let me state, for the record, that I have NOT been hired to play a role in Todd Phillips’ JOKER as some Donald Trump manque. That is not happening. Not. Happening." Were you excited for Baldwin's entry into the DC Universe? Let me know in the comments or hit me up on Twitter @MeganPetersCB to talk all things comics and anime!